Urgent: Why your WordPress website needs to be mobile-friendly – soon! Should You Use a Template Based WordPress Website or a Custom Design? Does your website have those 5 most common issues which cost you leads? I put together a list of 5 most common issues I see on the customer's websites over and over again. Those mistakes cost businesses leads and sales. Subscribe to our newsletter and receive a report about 5 most common issues which may be sabotaging your website performance. 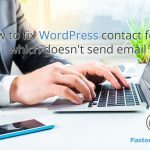 By filling this form, you agree to receive periodic electronic marketing and promotional communications from FasterWordPress.com and its employees and representatives, which may include, among other things, newsletters, promotions, invitations to social events and announcements. Consent may be withdrawn at any time by using the unsubscribe mechanism found in the electronic marketing and promotional communications.